This weekend we went fruit picking, as its pick your own season. It's such a simple thing to do with the kids, but even our hard to please middle child came away saying he'd had the best day ever! And with a view of the sea who can blame him? We went to Nicholaston Farm on Gower, and if you live locally i'd highly recommend you visit. If not then Google is your friend, just type in "pick your own" and the place where you live, and fingers crossed you can have your own fruit picking adventure. Even our 18 month old got stuck in. Following his big sister everywhere, rummaging for strawberries, and making "ooooh" sounds when he found some. His picks were usually the unripe strawberries, but it was great seeing him being able to join in with the big kids. When his little legs got tired, Daddy's shoulders came in handy. 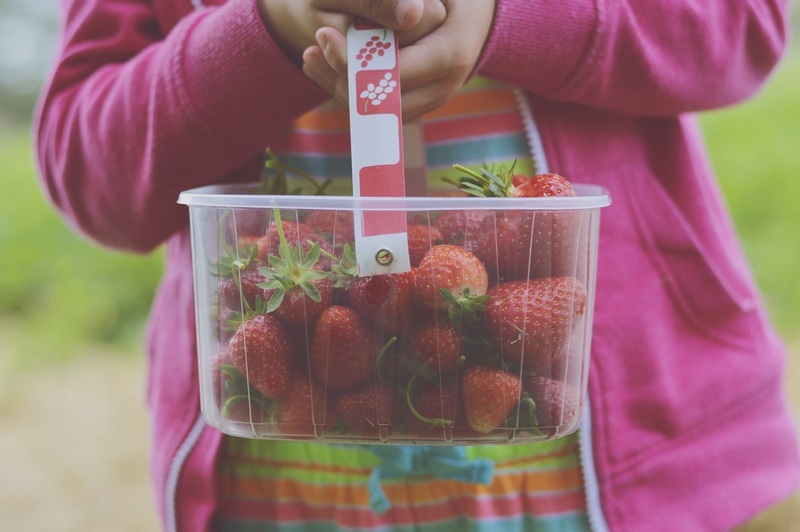 So often our adventures involve a lot of walking but if you are looking for a more chilled out, slow paced activity this summer, then fruit picking is perfect for you. We gave the 2 big kids their own punnet to fill, (a must to avoid squabbling!) they were so consumed with filling them, they were entertained for the longest time. And then we sat in the sun, taking in the view, and comparing the fruits of our labour (literally). Enjoying the view, and maybe a cheeky strawberry or two. Have you been to Nicholaston Farm yet? Or found somewhere locally to go fruit picking? I would love to hear how you got on in the comments. Don't forget the suncream and sunhats. Give the kids a punnet each, trust me. Go more for the experience than the fruit, but i'm fairly confident it will be so much better than anything you'll find in the supermarket.